Gene Black an Alabama Artist and Quilter: January 2018 Finish!!!! 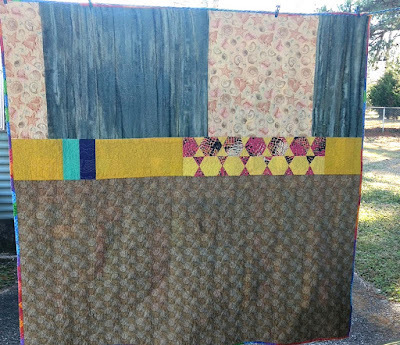 This quilt is finished and washed and ready to use. 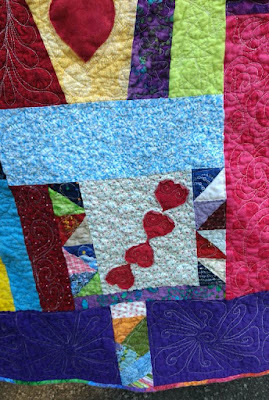 And here are a couple of angled shots so hopefully you can see more of that wonderful free motion quilted texture. The fabric I picked for the binding is a fun print that became much cooler cut on the bias. 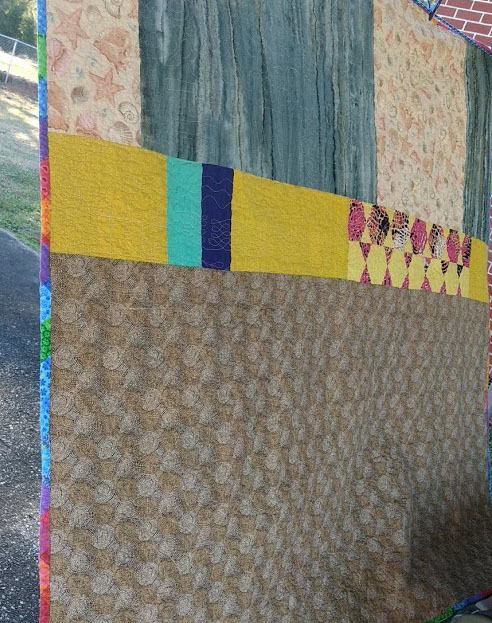 So - Yaay for my first quilt finish for the year. May it be one of many! That is a great start to 2018. I hope there will be many more finished projects too! Gene I LOVE It!! 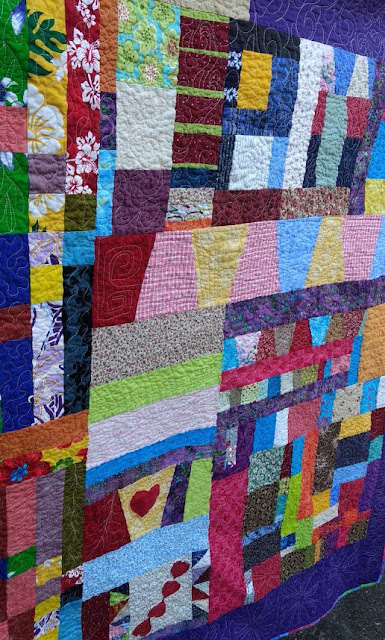 I love scrappy crazy quilts. Do I see a bunch of strips of American Samoan fabric possibly from Barb in the top left corner? If so, I have a hand sewing project with the same fabrics. Some of my favorite fabrics. Looking forward to your next big finish. Congratulations on your first finish of 2018!!! Great job! 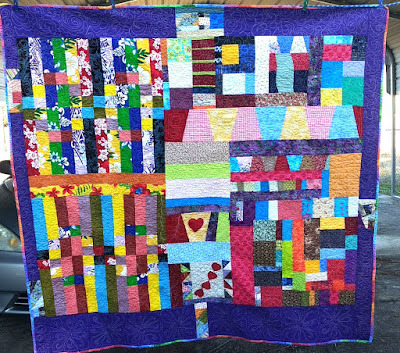 It is a very pretty and cheerful looking quilt. I think if I had ever mastered (or even progressed as far as "acceptable"!) free motion quilting I'd still be making quilts. I love doing the pieced tops but hand quilting was too slow and cumbersome, straight row machine quilting too boring, and free motion quilting beyond me. You do such a lovely job on yours. 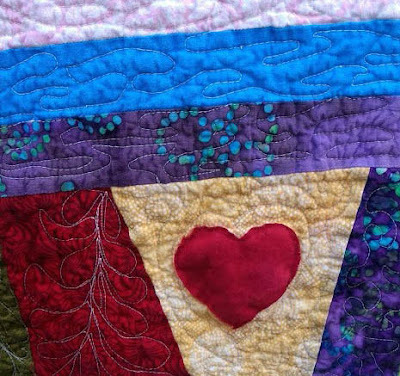 What do you do with all your quilts? Do you sell? Give as gifts? Pile them on beds? Hang them on walls? This is going to look great on the bed, Gene. Such happy colors and fun design. I'm so envious of your ability to machine quilt. I like the texture on this one very much. Congratulations on your first 2018 finish! Very cheerful. Nice size too, binding. is perfect for this. Love me some scraps. Way to go Gene. 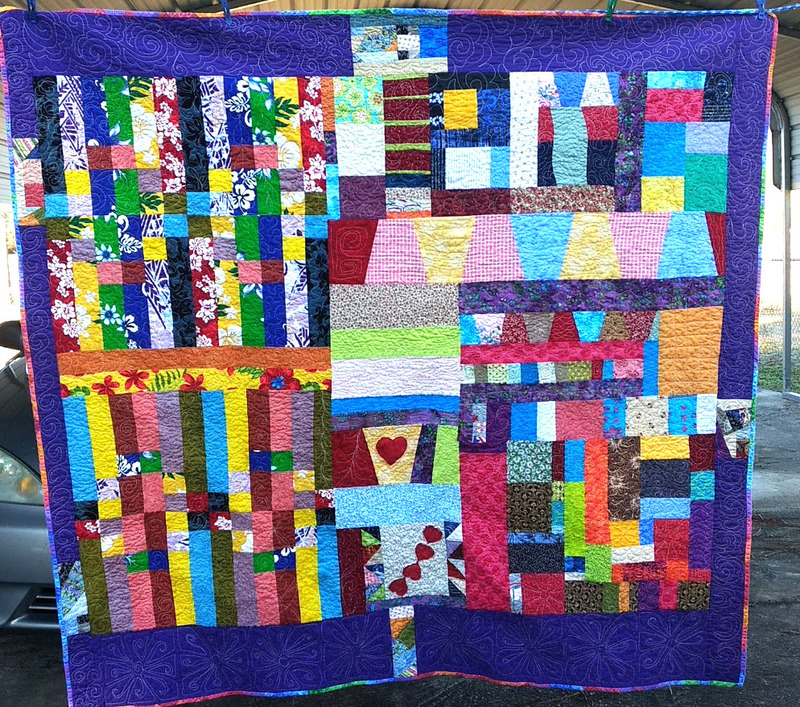 It's a great cheerful quilt that brought a smile to my day! !